Here is the second half of our Michael Myers double feature from our resident Twitter reviewer Tim Schilling. “Halloween 5: The Revenge of Michael Myers” was rushed into production for release less than a year after the very successful “Halloween 4” to negative critical reception and poor box office. Is the film really a diamond in the rough or did it deserve the horrible reception it received? Halloween 4 is probably my favorite sequel of the whole series. But, I haven’t seen this one in forever. Maybe that’ll change? 0:04 Legit, I don’t know why they just don’t chop Michael’s head off. That’ll be the end of him. 0:11 The dog better not die in this one. 0:18 Did something happen Jamie so you can’t talk or did they write that in with no reasoning? 0:21 Wah I liked you Rachel. Your death was pointless, and not even good. 0:28 Half of Halloween Resurrection was basically ripped off of this one. 0:40 I wonder how Michael learned how to drive? 0:45 That did not sound like cookie woman at all. 0:46 Oh okay you can talk again. Why? No reason. 1:01 These cops are so useless. 1:04 Boo editing. Release a movie the way it was meant to be seen. 1:12 I like how Rachel hasn’t even been mentioned since she died. She wasn’t a main character or anything. 1:24 Only this series could make a scene in a laundry vent thing last 5 minutes. At least it’s memorable. 1:24 Memorable as in this scared the crap outta me when younger. 1:25 Screw you. No reason to kill the dog. Completely pointless. 1:26 Danielle Harris is actually really good in this for being so young. She’s a scream queen at heart! 1:30 Dr. Loomis check yourself into an insane asylum. 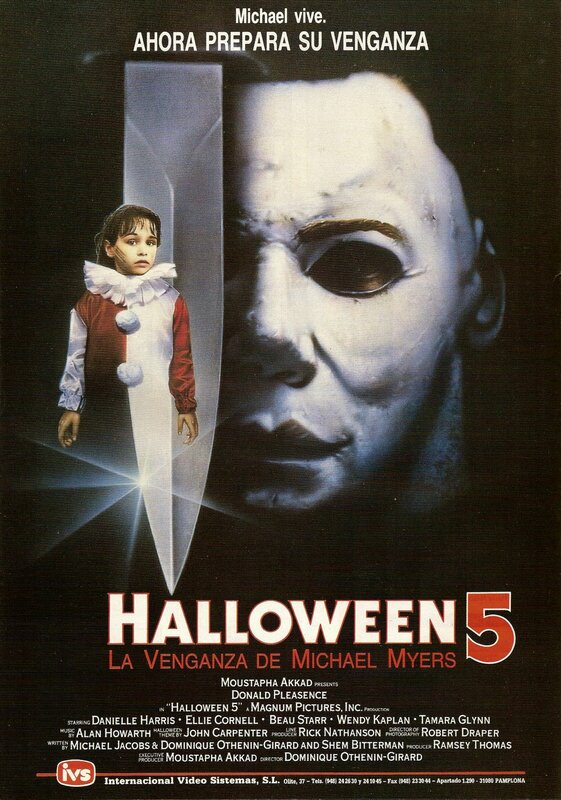 I like how Halloween 4 and Halloween 5: The Revenge of Michael Myers were connected. Similar tone, similar sets, but a different story that was a great continuation of the 4th installment, not mentioning some huge and completely random plot holes.